New York, NY (June 18, 2015) — Wine Spectator magazine, a publication of M. Shanken Communications, has announced it will be sponsoring professional golfer Thomas Aiken starting with this week’s U.S. Open. The sponsorship is for three years. Aiken, 31, a South African native, won the Order of Merit on South Africa’s Sunshine Tour in 2014, awarded to the player who earns the most prize money on South Africa’s professional golf tour over a minimum of nine tournaments. Aiken has also won three times on the European Tour, his most recent win coming at the 2014 Africa Open. Currently ranked 132nd in the Official World Golf Ranking, this is Aiken’s debut in the U.S. Open, one of professional golf’s four major tournaments. Aiken has also played in the Open Championship seven times, with his best result a tie for 7th in 2012; and has played in the PGA Championship twice. Aiken has also been a mainstay at the Alfred Dunhill Links Championship. Played in Scotland over several course, it is the European Tour’s equivalent of the PGA’s Pebble Beach Pro-Am. For the last seven years Aiken has teamed with M. Shanken Communications chairman and Wine Spectator owner Marvin R. Shanken in the tournament. This year marks the 115th playing of the U.S. Open. The tournament is being held at Chambers Bay Golf Course, which runs along Washington’s Puget Sound. It is the first time the course has hosted the U.S. Open. The first round begins Thursday, June 18, at 7:00 am PDT. Aiken tees off at 2:06 p.m. PDT alongside American Daniel Summerhays and New Zealand’s Danny Lee. Wine Spectator is the world’s leading authority on wine. Anchored by Wine Spectator magazine, a print publication that reaches more than 3 million readers worldwide, the brand also encompasses the Web’s most comprehensive wine site (WineSpectator.com), mobile platforms, and a series of signature events. Wine Spectator examines the world of wine from the vineyard to the table, and delivers expert reviews of more than 15,000 wines each year. The magazine also runs the Wine Spectator Scholarship Foundation, which has raised more than $20 million to support wine and food education and scholarship programs over the last 30 years. Foundation beneficiaries have included the University of California, Davis, Department of Viticulture & Ecology; the Culinary Institute of America; Cornell University’s School of Hotel Administration; Sonoma State University’s Wine Business Institute; and Florida International University’s Chaplin School of Hospitality & Tourism Management. Marvin R. Shanken is the founder and chairman of parent company M. Shanken Communications, Inc. whose roster also includes lifestyle publications Cigar Aficionado and Whisky Advocate, and industry journals Shanken Impact Newsletter, Market Watch, and Shanken News Daily. Greensboro, Ga. – June 18, 2015 – The Ritz-Carlton Lodge, Reynolds Plantation and Reynolds Plantation are celebrating Women’s Golf Month throughout the month of June. Georgia’s premier golf getaways, located on picturesque Lake Oconee, are offering exclusive packages, giveaways, clinics and more to salute female golfers and kick off the summer. Swing and Spa starts at $569 per night, and a two-night minimum is required. The package launched in June and will be offered through Sunday, November 15. To reserve your stay, please call the resort’s concierge at 706.467.0600. Reynolds Plantation golfers will receive a ticket for every round of golf played in June for a chance to win a custom fitting at The Kingdom, the property’s state-of-the art club fitting facility, a driver and two fairway woods or a new golf wardrobe courtesy of Adidas. Guests can join LPGA professional Dori Carter for an exclusive golf clinic on Friday, June 19, from 6:30 to 7:30 p.m. on the Oconee course. Complimentary wine will be served. To RSVP, please call the Reynolds Plantation member concierge at 706.467.1111.
cruise, and light hors d’oeuvres and wine will be served following the clinic. On Saturday, June 20, from 1:30 to 5 p.m., Reynolds Plantation will entertain female golfers on the Oconee course with a trunk show featuring Adam’s golf clubs and Adidas shoes. Reynolds Plantation and The Ritz-Carlton Lodge, Reynolds Plantation on Lake Oconee are located just 75 miles from Atlanta and offers 30 acres to explore. For more information about summer offers, events and packages, please visit http://www.RitzCarltonLodge.com. An AAA Five Diamond resort, The Ritz-Carlton Lodge, Reynolds Plantation is known for its meticulous Ritz-Carlton service enhanced by an abundance of gracious Southern hospitality. Situated within Reynolds Plantation on 30 acres of stunning shoreline property on Georgia’s Lake Oconee, the resort features access to 99 holes of championship golf designed by Bob Cupp, Jack Nicklaus, Tom Fazio and Rees Jones. Additional highlights include: 251 newly refurbished rooms with resort and lake views; a newly-enhanced 27,600-square-foot, full-service spa and fitness center; more than 18,000 square feet of recently-renovated meeting space including expansive indoor meeting and pre-function spaces; the Sandy Creek Barn, a restored 1820s classic wood beam barn; fine low-country cuisine at Georgia’s Bistro, updated classics at Linger Longer Steakhouse, casual dining at Gaby’s by the Lake and lakefront Chiminea dining; and outdoor activities ranging from fishing, swimming, waterskiing, jet skiing, paddle boarding and wakeboarding to horseback riding and hiking. For more information and reservations, please call toll-free (800) 826-1945, (706) 467-0600 or visit www.ritzcarltonlodge.com. visit the company web site at www.ritzcarlton.com, and for the latest company updates, visit news.ritzcarlton.com. The Ritz-Carlton Hotel Company, L.L.C. is a wholly-owned subsidiary of Marriott International, Inc. (NASDAQ:MAR). Reynolds Plantation, located between Atlanta and Augusta, Ga., is situated along more than 374 miles of Lake Oconee shoreline and features six championship golf courses, dining, swimming pools, pedestrian trails, marinas, a tennis center and a wellness campus. Reynolds Plantation is also home to The Ritz-Carlton Lodge, a 251-room lakefront resort and spa, which was named a 2014 AAA Five Diamond Lodging and 2014 Forbes Four-Star resort. The community is located about an hour and a half from Atlanta’s Hartsfield-Jackson International Airport. For more information, visit www.reynoldsplantation.com. Artur Mas, President of Generalitat De Catalunya, formally backed Spain’s bid for The 2022 Ryder Cup by welcoming Ryder Cup Director Richard Hills to Barcelona.. The formal reception was a conclusion of the evaluation visit originally conducted by Ryder Cup Europe in March 2015 – the schedule for which was curtailed by the Germanwings disaster. President Mas was joined by senior leaders from across the region of Catalunya to reinforce the institutional support for bringing The 2022 Ryder Cup Match to Spain. Speaking of the visit, Richard Hills said: “For us, political support is important and something we take into consideration when making our evaluation. It is encouraging to see institutional support, led by President Mas, for bringing The Ryder Cup to Catalunya”. Spain is the only country on mainland Europe to have previously hosted a Ryder Cup. When asked about this, Mr Hills replied: “The fact that Spain played host to the 32nd Match at Valderama in 1997 is no impediment to hosting the event again”. Ryder Cup Europe will announce the successful host for The 2022 Ryder Cup Match in Autumn 2015. ALEXANDRIA, Va., June 18, 2015– The 2015 U.S. Open, hosted by the Chambers Bay Golf Course on Puget Sound, Washington, is the first championship match played on a reclaimed sand and gravel site. Johnson, an avid golfer himself, noted that many former aggregates operations are transformed into parks, municipal water reservoirs, golf courses and amusement parks. Some are simply filled in and returned to their original state. Over time the Chambers Bay site has been used as a paper mill, industrial center, several lumber companies, a railroad center, and eventually one of the most successful quarries on the West Coast. Throughout its history, different aspects of the quarry changed hands numerous times before it was consolidated by Lone Star Northwest. Eventually it was bought by Glacier Northwest, a subsidiary of the CalPortland Company. Ron Summers, Senior Vice President at CalPortland Company and one time manager of the site, has played the course. He said the underlying layer of sand and gravel makes the course hard and fast. “It is going to be a challenging and exciting U.S. Open,” Summers said. “Steilacoom grade” aggregate from the quarry was some of the best in the region and highly sought after because of its extreme hardness. It is estimated that 95% of Seattle was built on the site’s sand and gravel. NSSGA is the leading advocate for the aggregates industry. Its members – stone, sand and gravel producers and the equipment manufacturers and service providers who support them – produce the essential raw materials found in homes, buildings, roads, bridges and public works projects and represent more than 90 percent of the crushed stone and 70 percent of the sand and gravel mined annually in the United States. Production of aggregates in the U.S. in 2013 totaled more than 2 billion metric tons at a value of $18.6 billion. The aggregates industry employs approximately 100,000 highly-skilled men and women. The area was originally settled by the Steilacoom Indian Tribe, who thrived in the region for more than 400 years. Soon after Europeans discovered Puget Sound in 1792, Hudson Bay Company established trading posts and the non-native population began to grow. Thomas Chambers, a prominent judge and businessman, built the first flour, grist and saw mills in the area. He ushered in an era of industrial growth. Today a golf course, park, elementary school and creek are named after him. Ironically, Chambers never set foot in the area that now bears his name. In 1890, the federal government contracted with the Pacific Bridge Company to begin mining the area for use in Army forts around the Sound. The different aspects of the quarry changed hands numerous times before it was consolidated by Lone Star Northwest. Eventually it was bought by Glacier Northwest, a subsidiary of the CalPortland Company. The quarry stretched from the waters of Puget Sound more than 3500 ft inland. In 1992, the property was purchased by Pierce County, Washington for $33 million. With an additional $21 million investment, the Chambers Bay Golf Course, designed by famed course architect Robert Trent Jones, Jr., opened on the site in 2007. Since Washington state had never having hosted the U.S. Open, Chambers Bay with its sand base was a natural choice for the tournament. It features a 70-foot tall sand dune covering seven acres, fairways the width of a football field and 60-foot long tees make this a dramatic course, with elevation changes, bunkers and greens providing character and playability. STANWOOD – Golf course architect James Engh is elated the LPGA’s Symetra Tour is stopping in to play the Tullymore Classic at Tullymore Golf Resort on the Fourth of July weekend, but not because he wants to see professionals take on the classic golf course he designed. The Tour staff will do the course set-up and Engh said tournament experts can make almost any golf course as easy or as hard as they choose. He just hopes they take advantage of the flexibility, versatility and variety of the course design. The 54-hole stroke play championship will tee off on Friday, July 3, and conclude on Sunday, July 5. The top 144 up-and-coming professionals in women’s golf will compete for a purse of $100,000. The winner will earn $15,000 and have an opportunity to move into the top-10 on the Volvik Race for the Card money list. The top-10 on the year-end Symetra Tour money list earns LPGA Tour membership for the 2016 season. Tullymore can play well over 7,000 yards from the back tee positions with as many as six possible tee positions on each hole. The Symetra Tour works on courses around the country and will find the comfort zone for its players. Engh said he designed the course so that a comfort zone could be found for all golfers regardless of ability. Tullymore can challenge the pros Engh feels, but he doubts they will find it too difficult. He said designing a course today that would function only as a dramatic challenge to touring professionals without having to be tricked up would not make sense. Fans who attend the Tullymore Classic should enjoy the course as much as watching the players. When Engh first came to the property he was captivated. Awards came quickly, too. Tullymore was named the Best New Public Upscale Course in 2002 by Golfweek, and it has been a regular among the Greatest Public & Resort Courses in America by Golf Digest in the last 13 years. Engh finished Tullymore while on a hot streak with awards. In 2003 he was Golf Digest’s Architect of the Year. Visit www.enghgolf.com for more about Tullymore’s designer. ABOUT TULLYMORE: Two distinct world-class golf courses welcome golfers to Tullymore, including the award-winning Tullymore course. In addition, St. Ives Golf Club is a prime example of the best design work by Michigan’s own Jerry Matthews. The 36 holes of great golf wind amid 800 acres of glacier-carved rolling Michigan woodlands and wetlands in the captivating Canadian Lakes area. The luxuriously appointed accommodations and premium amenities like the fitness center, indoor and outdoor pools, and two comfortable clubhouses with great dining service options make for more reasons to visit and stay for a while. Choose from a getaway for two in the cozy inns, or a cottage, condominium or rental home for an unforgettable few days away or even a home away from home. Tullymore was named Michigan’s No. 1 Golf Resort and one of the Top 50 Golf Resorts in the U.S. in the 2010 Golf World Readers Choice Awards. It has also been selected as a Silver Medal Winner – Premier Resorts 2010 – The Best Destinations in Golf by Golf Magazine. Sponsorship opportunities, playing spots in the Tullymore Classic pro-am and some volunteer slots remain available. Visit www.tullymoreclassic.com for more tournament information and to be a part of the Tullymore Classic. Visit www.tullymoregolf.com for resort information, and for reservations, call 1 (800) 972-3837 ext. 239. (Battle Creek, MI.) June 10 2015- FireKeepers Casino Hotel hosted the second annual FireKeepers Casino Hotel Championship, June 2-7. FireKeepers partnered with the Battle Creek Country Club to bring the Symetra Tour-Road to the LPGA back to Battle Creek for the second year in a row. The second year of the FireKeepers Casino Hotel Championship saw vast improvements in the amount of community involvement. Volunteerism grew by 40 percent, with community members throughout Battle Creek volunteering in various capacities during the tournament week. This year 48 golfer’s enjoyed housing through the generosity and kindness of Calhoun County residents and many golfers returned to the families that housed them in 2014. The biggest single sign that the regional community was excited about this year’s event was attendance, which doubled in 2015 compared to prior year. The FireKeepers Casino Hotel Championship benefactor was S.A.F.E Place women’s shelter, which aids women and children affected by domestic violence in Calhoun, Eaton and Barry counties. Thanks to the many attendees and sponsors, the amount of money the tournament generated for S.A.F.E Place increased 20 percent from last year. FireKeepers Casino Hotel is located just off Interstate 94 at Exit 104 in Battle Creek, Mich. The property features a 111,700-square foot gaming floor with 2,900 slot machines, 70 table games, a live poker room and bingo room. FireKeepers also offers a AAA-rated Four Diamond resort-style hotel with 243 rooms, a functional multi-purpose event center capable of seating up to 2,000 guests, six distinctive dining destinations and multiple lounges and entertainment venues. For more information visit www.FireKeepersCasinoHotel.com. (VIENNA, VA) – Billy Casper Golf (BCG) and Sol Boards have partnered to feature GolfBoard – the first and only substantive, surf-inspired, motorized golf vehicle built specifically for the sport – at numerous BCG owned and operated golf courses, country clubs and resorts across America. The company will also serve as GolfBoard’s exclusive sales agent in central and northern New Jersey, and the greater Chicago, Cincinnati, Jacksonville, Philadelphia and Washington, DC areas. Conceived by Bally Total Fitness Founder Don Wildman and legendary big-wave surfer Laird Hamilton, GolfBoard allows riders of all ages to “surf the earth,” reveling in the fun, fast and active experience of GolfBoarding. Powered by a rechargeable lithium-ion battery, GolfBoards are easy to use, ultra-durable and built with a safety-first mantra to provide golfers a more active alternative to riding in a cart. The four-wheeled board allows users to turn by intuitively shifting their body weight, and adjusting maximum speed settings from 6 to 14 mph via simple, one-touch stability bar switch. With GolfBoarders surfing directly to their own balls, pace of play has decreased 30 minutes or more per round, helping course operators shrink tee time intervals, and increase play and revenue without a large capital expenditure. Superintendents report GolfBoards don’t cause turf damage like other means of transport. Millennials and golf traditionalists are turning to GolfBoard in droves with industry pundits dubbing “GolfBoarding” a paradigm shift akin to introduction of two-piece golf balls, plastic cleats, metal woods and oversized drivers. 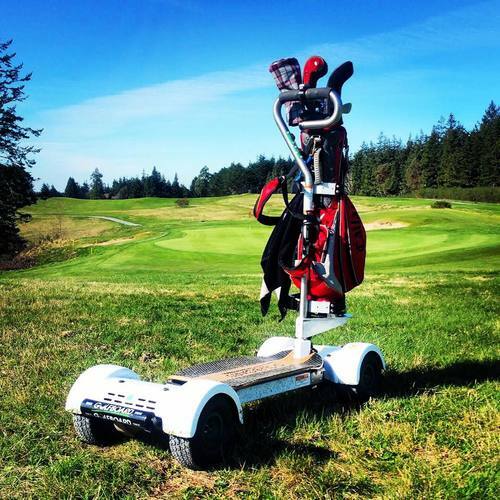 Available since April 2014, GolfBoard is now offered at almost 100 courses in the US, Canada, and Mexico. More than 300 additional private, daily-fee and resort courses are scheduled for product delivery over the next 90 days, and hundreds of individual golfers – including PGA Tour stars and A-List celebrities – have purchased units. Developed in conjunction with top engineers with experience building key components for military vehicles, and other highly specialized industrial-strength equipment, GolfBoards are uniquely designed. Features include a proprietary slip resistant 4wd posi-drivetrain for ultimate traction on steep hills and wet environments; a rugged suspension system and “Turf Max” tires for maximum stability; and a state-of-the-art automatic braking system to lock the GolfBoard into place upon stopping (riders just step off and hit their next shot). Dual grip stability bar for ease of use and added secutity of beginner riders. The GolfBoard battery has the capacity for up to 1,600 re-chargings and can be fully charged in just two to three hours. With a maximum range of 15 to 18 miles, a GolfBoard is typically recharged between rounds in one hour or less. A product of Sol Boards of Bend, Oregon, GolfBoard is a new, easy-to-ride electric powered 4wd board that adds fun and excitement for golfers of all ages and athletic ability. There are two versions of the GolfBoard: a commercial-grade Courseboard ideal for rental fleet use, and a personal use Sportboard with detachable stability bar that allows users to advance to “freeriding.” A wide selection of custom fender colors, decks and graphics and are available as are affordable personal and fleet leasing options via GB Leasing. (RESTON, VA) Women on Course – America’s premier networking organization that introduces like-minded women to one another through golf and its amazing lifestyle – is celebrating Women’s Golf Month by hosting “Clinics Across America” to encourage and increase female participation in the game. On Tuesday evenings in June, highly entertaining and educational clinics teach basic fundamentals and sharpen skills of female golfers in Chicago, Cincinnati, Los Angeles, Orlando, Philadelphia, Phoenix, San Diego and other major markets. For $10, participants receive 60 minutes of professional instruction in a fun and supportive environment, range balls and glass of wine (age appropriate). Starting times vary by course; to register for a clinic near you: www.womensgolfmonth.com, 703.940.3511. Last year, women played 5.3 million golf rounds (21.5%) and are among the game’s largest growing demographics. With females representing 36% of all beginners and 40% of latent demand (interested non-golfers), Women on Course is introducing to and retaining tens of thousands of women in golf. Women on Course’s unique approach of shifting focus away from score and competition has resonated across America, helping boost memberships by 200% in 2014. More than 2,000 annual golf and non-golf events serve nearly 20,000 women to improve golf skills and form lasting personal and business relationships. Fashion, fitness, travel and luxury components surrounding the world of golf are incorporated into Women on Course programming. Members enjoy free gifts; special access to private clubs; discounts on greens fees, apparel, equipment, wine and other products; golf and educational resources; contests; and forums. Women on Course hosts golf, lunch, happy hour, wine and spa activities in Atlanta, Boston, Chicago, Dallas, Denver, Houston, Los Angeles, Philadelphia, Scottsdale, San Diego, San Francisco, Washington, DC and other major markets. Upcoming Destination Events include the “3 Day Desert Oasis” event in Scottsdale, AZ, a three-day weekend event at the Fairmont Scottsdale Princess resort. CHARLESTON, SC (June 2015) — Whether it’s the greatest tee time of them all at the Old Course in St Andrews or an Irish links odyssey, the golf travel experts at Golfbreaks.com are now assisting Americans with their golf vacation of a lifetime in the British Isles — and at a price that won’t break the bank. Founded in 1998 just outside London, England in the shadow of Windsor Castle, Golfbreaks.com has arranged golf trips for more than 1.5 million British and Irish golfers, establishing a reputation for expert service and great value. This award-winning and highly respected company — a partner of both the European Tour Properties and The PGA of Great Britain & Ireland — is now helping American golfers take the stress out of arranging their golfing pilgrimage. That means taking care of everything from tee times and hotel rooms to flights and ground transportation … as well as offering the very best prices and packages to suit all budgets. Built on the principles of outstanding choice, value and service, the privately owned company now has an American office, based in Charleston, SC, and recently launched a website specifically for American golfers, USA.Golfbreaks.com — which will surely inspire anybody who has ever dreamed of teeing off at legendary links such as St Andrews, Royal Birkdale, Turnberry, Royal County Down or Royal Porthcawl. As part of this launch, American golfers are now eligible to win a seven-night golf vacation playing five of the most spectacular golf courses in South Wales. Golf in Wales is golf as it should be — offering unspoiled natural landscapes, breathtaking views, the warmest of welcomes wherever you go and the opportunity to play at your own pace. And while the legendary names of Scottish and Irish courses might top the global rankings lists, the likes of Royal Porthcawl, Royal St David’s and the famed Twenty Ten Ryder Cup course at Celtic Manor need little introduction to savvy golfers who flock to the fairways of Wales. The winner receives a seven-night golf vacation to South Wales for four people, including three nights bed and breakfast at the Marriott Cardiff hotel, four nights bed and breakfast at the Dragon Hotel in Swansea, five rounds of golf at Pennard, Twenty Ten course at Celtic Manor, Ashburnham, Machynys Peninsula and Royal Porthcawl, and car rental for the duration of the stay. “Our brand and identity in the UK and Ireland has been built upon proving to golfers that we will save them time and money,” said Daniel Grave, a founding partner of Golfbreaks.com and CEO of Golfbreaks USA. “We save golfers time by booking all their tee times, doing all the running around for them, putting their trips together. And we save them money by getting them the best possible price — a price that is not only better than the competition, but also better than the price they would get if they tried to book the trip themselves. Following every trip, Golfbreaks.com sends each individual trip organizer a detailed survey regarding their experience and the Golfbreaks.com service. More than 98 percent return with a very good/excellent rating of the overall service — and say they would book with Golfbreaks.com again. Learn more at (855) 699-5853 or USA.Golfbreaks.com. Golfbreaks.com (established in 1998) is a specialist golf travel company, with its headquarters in Windsor, UK, and offices also in Charleston, SC, and Copenhagen, Denmark. Its aim is to save golfers time and money, by providing a unique one-stop service that makes booking golf vacations as simple as possible. With an expert team that is passionate about golf and travel, the company is known for delivering outstanding service at unbeatable prices. Golfbreaks.com is an Official Partner of The PGA of Great Britain & Ireland, European Tour Properties and also GolfNow, the leading tee-time booking and golf course technology and services platform. Learn more at (855) 699-5853 or USA.Golfbreaks.com.